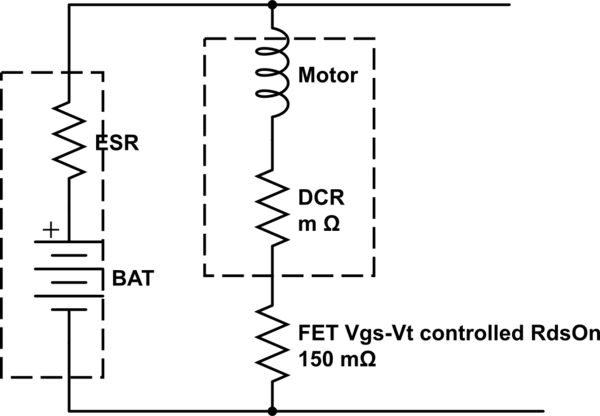 I'm building a MOSFET controlled DC motor circuit with a 6V battery as the supply. Although when I turn the MOSFET on, the voltage at the battery positive drops to about 2.5V. I thought it could be back emf from the motor, but it stays at the lower voltage. Maybe it's the way I set up the circuit? Can anyone see what might be causing this problem? Note: That the inductance in the schematic for the motor is made-up. And that I am using an IRLB8721 MOSFET, not the one in the schematic. Edit: The solution it seems that the batterys I'm using either cannot supply enough current or they are low on charge. Thanks! There is a relationship between Ah capacity of a battery and it's ESR. 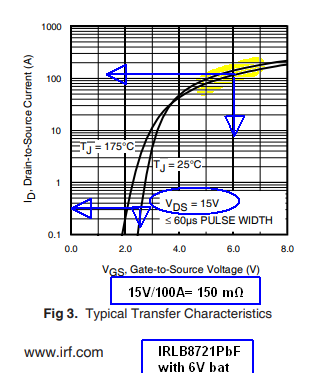 YOUR FET is rated at 8.7mΩ @ Vgs=10V and Vgs(th) 1.35 to 2.35 V only conducts 25uA so at 2.5Vdc it's probably < 50 Ohms so your battery has high ESR. Your Motor also has DC resistance or DCR which you can measure with a DMM. This causes a surge current of V+/DCR which normally reduces to 10% at its rated load and 1% at no load. Battery DCR rises with age and State of Discharge (SoD) rapidly < 10% from sulphation or electrode oxidation etc. If the battery voltage is falling to 2V then you're drawing more current than the battery is able to supply. The battery may be running low, or it may be too small for your motor. If the motor is stalled, it might allow too much current to flow and cause other problems in addition to this one. Back EMF from a motor is a different thing. It will be less than the motor's supply voltage and will cause current into the motor to drop while the motor is spinning. Not the answer you're looking for? 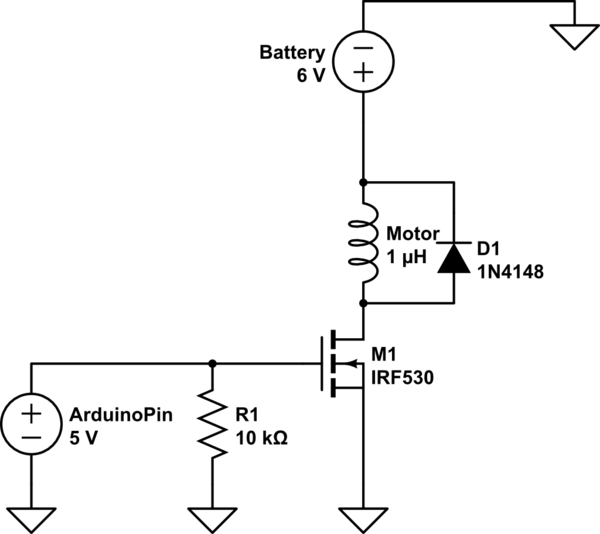 Browse other questions tagged arduino mosfet motor or ask your own question. Can a circuit “just stop working” after not using it for a long time?